Biffy Clyro have said they wish more bands were like the Arctic Monkeys and have praised how much music they produce. The T In The Park headliners were on Zane Lowe's BBC Radio 1 show choosing their highlights from the festival and went with fellow headliners Arctic Monkeys. 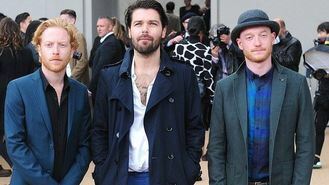 According to NME, frontman Simon Neil said: "People can forget how productive they've been. Really, they haven't stopped at all. To still have that evolution in this record, to really take a huge step sideways and forward, it's opened up the possibilities for the next 10 years for them as well. I wish all British bands were like this." Simon's bandmate, drummer Ben Johnston also admitted that sometimes the band need a reminder of their own songs: "We played Ireland a couple of shows recently, and we played Hero Management from the first record, and I don't know how truthful I should be here but in the practice room we had to get our iPods out." Simon agreed: "The amount of brain cells I've killed over the years. I messed up words, actually, I forgot the second verse of Victory Over The Sun at T on Friday and it's always when I least expect it, because the songs that I think I don't know, that we haven't played in a while inevitably are perfect, and there's only a certain amount of room for a number of songs in my little brain, so whenever I write a new song it normally pushes an old one out." Festival organisers have defended their decision to book Lily Allen after the singer received Twitter abuse for stepping in to headline Latitude. Festival-goers began this year's Latitude festival with yoga classes, a knitting circle and an olive bar. Beyonce's outfits from her Super Bowl performance and music videos are to debut at the Rock and Roll Hall of Fame and Museum in a section previously featuring only Hall of Famers. JB Gill has revealed his solo career is on the backburner. Beyonce is the leading nominee for the 2014 MTV Video Music Awards. Lana Del Rey has said she feels crazy and that she doesn't make music for anyone else but herself to listen to. Sir Elton John has suggested he is ready to retire - again. Boyzone's Keith Duffy has revealed the band are exploring their funky sides with a new Motown album. Blink-182 have announced to their fans that they have reunited and will be releasing a new album after their shows in Europe.